Young virtuoso performers from Japan and Russia shared the awards in the Second International Violin Competition “Vasco Abadjiev”. It ended with a gala concert on Sunday evening at the National Music Academy “Prof. Pancho Vladigerov”. The jury headed by prof. Angel Stankov did not award first prize but second for 3 300 Euros. Once again it was provided by the prize fund of “Unicredit Bulbank”. Fifteen talents from all over the world took part in the event that was organized by the Club for UNESCO Leonardo da Vinci Sofia under the patronage of the Ministry of Culture. Daichi Nakamura was born in Fukuoka and had played the violin since 3 years of age. Now he is a violin student in Vienna. The beauty Stekolshchikova comes from the faraway Vladivostok. She graduated university in St. Petersburg. Along with the winners the big star of this year’s competition was the Russian member of the jury – prof. Mihail Gantvarg, president of the St. Petersburg Music Academy. His visit was made possible through the financial support of the National Fund for Culture. Prof. Gantvarg and his colleagues awarded third prize to Sanjar Sapaev from Uzbekistan. Dr. Laurits Larsen from Denmark who himself is a violinist and one of the leading producers of strings, was again a member of the jury. 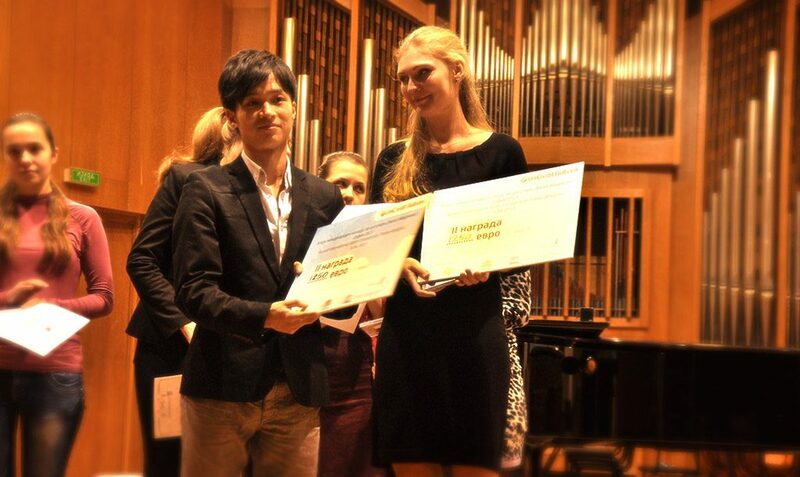 He donated 500 Euros for best performance of a musical piece by Bach. The prize went to Eunmi Lee from South Korea. The prize of 300 euros for best young performer was taken by the 16 year old Polish girl Chanelle Bednarczyk. „We would be happy to host the third violin competition in two years. Thanks to this initiative our students became familiar with the name of Vasco Abadjiev”, declared the President of the National Music Academy and honorary member of the jury prof. Dimitar Momchilov. The first competition in 2011 was won by the exceptional German talent Stefan Tarara. The goal of the contest is to revive the national and world memory of the great violinist Vasco Abadjiev (1926-1978) as well as to encourage the development of young violin talents – successors of the spirit of Abadjiev.